Congratulations to Tracy and Jon Morter for helping music fans across the UK actually accomplish something. 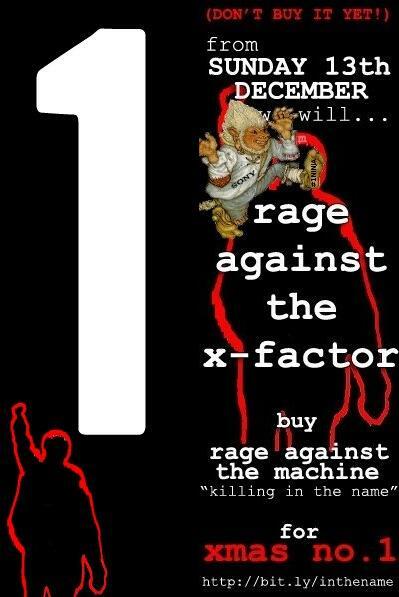 Last night, Rage Against The Machine soared to the top of the charts, beating their X-factor rival, Joe … something (McElderry – Ed) to take the Number One Spot for Christmas with their 1992 anthem, Killing In The Name. This was a direct result from Jon and his wife Tracy setting up a Facebook campaign to bring the politically charged noise makers to number 1 and X-Factors four year strangle hold of the coveted spot to an end. Not only is this a sign that people are starting to really hate (or, strongly dislike for those of you with harsh feelings towards the ‘H’ word) the X-Factor (despite the fact that 2009 saw it’s highest TV rating ever), but it’s a testament that people are still prepared to pay for their music…if the cause is right. We all know that the last ten years of illegal downloading and file sharing have decimated record sales to the point that major, major bands, who are generally guaranteed a pretty good return on any full length player they dish out, have turned their backs on the traditional release in favor of exploring new avenues of releasing music. As for the giant pop churning monster, they’ve hijacked almost every form of major entertainment television, radio and website to deliver packaged deals of the same looking / sounding guys and gals for your viewing, gossip and finally, Listening (cringe) pleasure. Now Tickets There isn’t about to get into attack mode against X-factor styled artists and their fans because that wasn’t the spirit of this campaign, but we are delighted to see X-Factors hold over one of these institutions broken and it was the people, not some massive multi-million pound machine that did it. To some, this victory will look small and as far as Simon Cowell was concerned, ‘very scrooge like’. Well, Tickets There would like to say sorry to all the naysayers but this is a brilliant achievement and one of the major, major musical highlights of this first millennium decade. It’s rare these days that fans of ‘real’ music come out and show the world they’re still around and in the UK last week, they came out in spades. Before we finish, Tickets There feels we should remind Mr. Cowell that Scrooge was a character who was rich and powerful and kept it all from himself while many less fortunate, but much more deserving people around him starved. After being visited by three ghosts, Scrooge changed his ways, shared his money with all and everyone lived happily ever after. Why don’t you share that industry money, that power and that influence with bands who work their asses off seven days a week to scrape enough money together just so they can record another track rather than piss it all away on these fleeting acts that server nothing more than to make you, your company and Song BMG a quick buck. That kind of mentality is destroying the music industry and finally the people have said Enough! Oh, and Simon Cowell – SCrooge (just pointing that out). This entry was posted on December 21, 2009 at 2:44 pm and is filed under Music, News with tags Joe McElderry, Killing in the name, Killing in the name of, Rage Against The Machine, RATM Christmas Number 1, Tracy and Jon Morter, X-factor, Z-factor beaten. You can follow any responses to this entry through the RSS 2.0 feed. You can leave a response, or trackback from your own site.